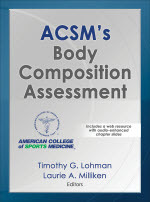 Description: ACSM’s Body Composition Assessment describes advances in body composition assessment, both in children and adults, with applications to the fields of medicine, exercise science, nutrition, growth and development, and geriatrics. This text provides descriptions of numerous body composition methods for use in both laboratory and field settings, protocols for the standardization of each method, and advantages and limitations for each method. An accompanying web resource contains audio-narrated PowerPoint slides to support a deep understanding of the content. The text is an ideal reference for practicing fitness, health, and medical professionals; nutrition specialists; and exercise physiologists.